Long weekends spent at my family's home up north mean three things: lots of rest and relaxation away from cell phones, plenty of time spent playing with and walking dogs and evenings spent around the dinner table with high-quality ingredients prepared simply to leave us more time to enjoy one another. Last night we were treated to a dinner of the most beautiful rib eyes I have ever seen, grilled by my father. No one I know can grill meat better than him. Perhaps it's because I grew up on his food, but no restaurant I have ever been to has matched the flavors or the perfect degree of "doneness" that he brings inside from the grill. Last night he was using a Weber with 100 percent natural mesquite charcoal. When I feel compelled to take a picture of a piece of raw meat, you know dinner is going to be good. 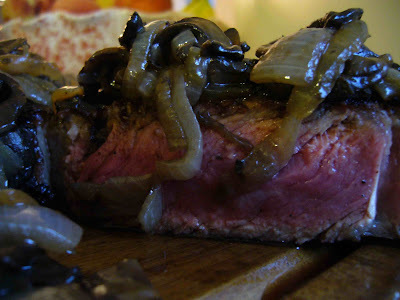 To make these guys "smothered" we sauteed vidalia onions and portobellos until caramelized. Just cut up some fresh produce and throw in tomatoes from the garden for a salad and dinner is served. Drizzle the steaks with soy sauce and sprinkle with salt. Leave them to marinate for a few minutes while you heat up the grill. Slice the vidalia onions and portobellos into 1/4" to 1/2" pieces. Heat the olive oil in a large pan over medium heat, add the onions and saute for about five minutes before adding the mushrooms. Cook for an additional five minutes before adding the balsamic vinegar. Allow the mixture to hang out over low heat, stirring occasionally, while you grill the steaks (this process can be made much easier if you're inside taking care of the smothering, while dad is outside grilling and mom is getting the salad ready - I love family weekends). Once the steaks have reached your desired doneness. Bring them inside and let them sit for ten minutes before slicing in half and layering the smother on. Serve with salad and veggies and enjoy! Rib eye really is the best cut of steak - so tender but so much flavour! I love the smothering: I haven't done that before but I certainly will! The steak looks incredible and I love what you "smothered" them with--what a perfect combo of flavors. Sounds like a great getaway trip... Family and good food...I can't think of anything better. 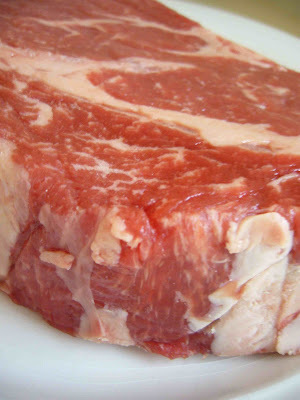 The pictures of the smothered rib eye look wonderful and so flavorful. These do look like bautiful rib eyes!